jenmcnitt had the most liked content! Not a problem. Here are a few photos. They are two different LEDs. When I ordered it, I selected the option where you can easily swap out the led part to whatever color you want. There is a clip on the led wires that let you do this. It is a bit hard to explain, but I can take a picture if that would be helpful. 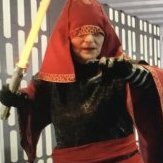 Just throwing this out there but I have a Ultra Saber Shock (with sound) that has both red and purple leds that can be swapped out that I'm going to be selling since I'm upgrading to a different saber. I would like it to go to a good home. What was wrong with the stl files? I believe I have the same ones but have not started printing yet. What layer height are you using? Are you printing in PLA? Thanks! Requesting 501st and Detachment Access. SL-72172 https://www.501st.com/members/displaymemberdetails.php?userID=25297 Thanks! I am having some difficulty finding the right kind of boots so far. The boots I've found so far in the right style are mens, but they are too large. I wear a size 7.5 womens. Does anyone have a source suggestion? Thanks! I've started my investigation on how to build the various items for this costume, and I have a couple of questions that will help me get started: Is there a pattern that you recommend to start with for her gown? It looks fairly straightforward other than for the folds at the shoulders. I usually like to start with a pattern that I can adapt when possible though. What wig source have others used? Here is one option that I've considered: https://arda-wigs.com/shop/le-tigre-classic/ Should I go with the white or silver wig color? I've been looking into getting a saber from Ultra Sabers. Would the 'Shock' hilt be appropriate for her? http://www.ultrasabers.com/product-p/stunt-shock.htm It seems that it is similar to the 'KOTOR II' style, but I wanted to get your opinions. For the hair bands, am I assuming correctly that the band size height is what should change from top to bottom band? What type of closure have you found works the best for the black wide belt? I think that is it for now. Thank you! Greetings! 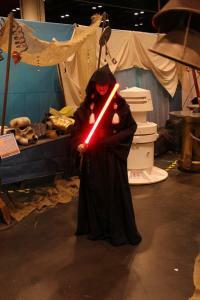 My name is Jen, and I am working toward creating a couple costumes to join the Central Garrison. 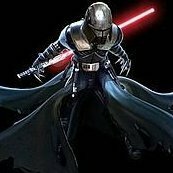 I would like to make both the Darth Traya and Visas Marr costumes with a goal of getting them 501st approved. I have a couple other friends who are members of the 501st and have been inspired by the work they do. I've been making costumes for a number of years, but these will be my first Star Wars specific costumes. In often lean toward making costumes based on video game characters so these two initially interested me. My goal is to have at least one done by Celebration next year if not both.